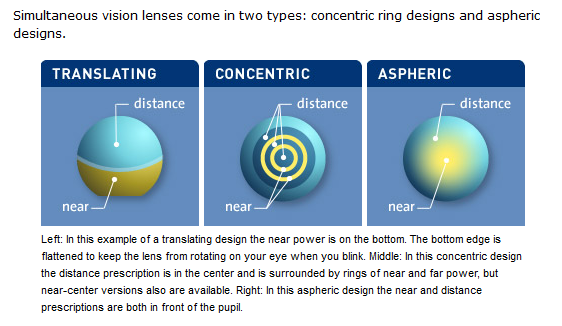 Bifocal contact lenses have two (powers) prescriptions in the same lens where as Multi-focal have a range of powers. Translating: (alternating vision) lenses – the pupil alternates between the two different powers, as your gaze shifts up or down. Simultaneous lenses: you will be looking through both distance and near powers simultaneously. Sounds crazy impossible, however our brains can work it out. – Your visual system learns to select the correct power choice depending on how near or far you’re focussing. The most widely used lens is a concentric bifocal pattern lens, which features a small central circle, surrounded by a larger circle that contains the distance correction. This arrangement can also be reversed. This type of lens can come in a ‘simultaneous design’ – which puts the near and far parts of the lens together in front of the pupil; or ‘alternating image design’ – which is the most like multi-focal glasses, arranging near vision at the bottom of the lens and distance vision at the top. This type of bifocal contact lens features a prescription in the center and one or more rings of power surrounding it. If there are multiple rings, they alternate between the near and distance prescription. Typically, at least two rings are within your pupil area, but this varies as your pupil expands and contracts due to varying light. GP bifocals usually have the distance power in the center (called center-distance). Soft bifocal contact lenses usually have the near power in the center (center-near). Some soft multi-focal designs are center-near on your dominant eye but center-distance on your non-dominant eye. These multifocal contact lens designs work more like progressive eyeglass lenses, where the different prescriptive powers are blended across the lens. Unlike eyeglasses, however, aspheric contact lenses are simultaneous vision lenses, so your visual system must learn to select the proper prescription for the moment. This is the only type of multifocal contact lens that can be described as “progressive.” It’s also concentric, like the concentric ring designs, and it has become the most popular type of multifocal contact lens. Bifocal and multifocal lenses can help with presbyopia – an age-related condition that affects a person’s ability to focus on close objects. If you are having problems focussing up close, even with your reading glasses on, you should make an appointment to see your optometrist who will be able to assist you. After the initial tests, your optometrist will then discuss all your options and prescribe best option for your needs.